A sub-blog about Fredrik’s and Outi’s three week trip to Sout East Asia during Christmas and New Year 2009-2010. Hangover. Major hangover. The local vodka we had last night was either too impure or too plenty, or both. It’s the first day of the new year and our last day on Gili Trawangan. Today’s activities are kept to a minimum, we need to eat and Outi wanted to do some tanning on the beach. And since we’re leaving early in the morning on the 2nd, we need to make all preparations today. But that’s already more than our (or especially Fredrik’s) physical condition allows. As we mentioned before, there are no motorized vehicles on the Gili Islands, the only means of transportation are your own two feet, bicycles and cidomo (the horse-drawn carts). We tried out the cidomos yesterday on Gili Meno, but the horses didn’t seem to enjoy their position, so today we decided to rent a couple of old bikes (24h for 80.000 rupiah / 6 euros) and make a sight-seeing tour around the island. Life here on the Gilis is easy. You get up, get breakfast served to either one of your balconies, go to diving school or out snorkeling, take a nap before dinner, go out to one of Trawangan’s many excellent restaurants, have a few beers and watch the sun set behind the island’s only ”mountain”. There’s really not much you can do on an island not much bigger than the Suomenlinna sea fortress outside of Helsinki. The sea is everywhere and that’s what offers the most activities. The day had come. We retired early yesterday to have time for a good night’s sleep before the early wake-up and banana pancaces with mixed fruit juice on the ”breakfast balcony”. With satisfied stomachs and skin smelling of sun lotion, we packed our backpack and headed for school, scuba diving school. At the time of writing, the first day of our PADI Open Water Diving course has been successfully executed, earning us a couple of beers and some quality time with the laptop. And we can’t wait to go back to school tomorrow. Where do we begin? With the clear turquoise sea, with the mountain contours in the horizon, with the dozens of restaurants and bars scattered along the never-ending beach or with our bungalow’s two balconies? We’ve arrived in paradise, at least compared to Bali. 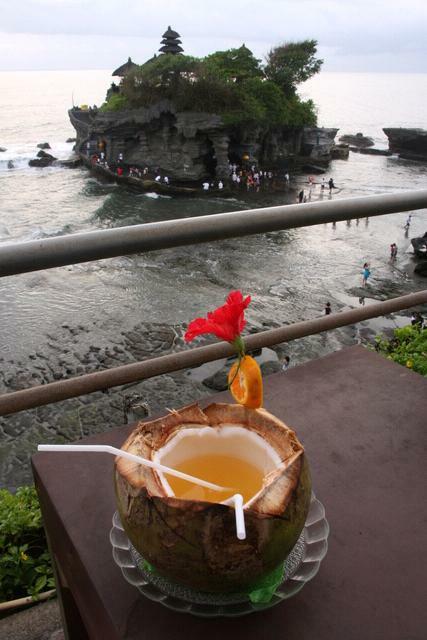 Tanah Lot and the Coconut Cocktail. December 24th. Here it’s a normal day as any other. Christmas is celebrated mainly for the tourists and since most tourists celebrate Christmas on the 25th or 26th, this day is just another Thursday. The usual American Christmas songs about winter wonderland and chestnuts over open fire and so on are played in shopping malls and kiosks although it’s over 30 degrees hot. Even our frequently visited MiniMart where we can use the internet for free has got snowflakes and snowmen in the window. Despite these attempts to create a Christmas feeling, the real Christmas spirit is about 9000 km northwest. Our two wheeled Mio quickly became our best friend here on Bali. Instead of tiring our feet with walking, Mio took us from A to B (mostly via C and/or D) quickly and painlessly. After two days of driving, we’ve become accustomed with the Balinese way of driving. Excessive use of the horn to make fellow drivers aware of your exstence, zig-zagging between cars, bypassing on either side as long as there is just enough room, and taking other vehicles in consideration to create a dynamic and, though a bit chaotic, quite well functioning traffic.